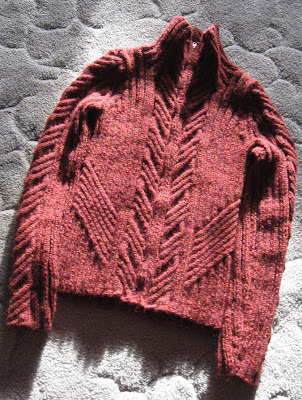 I’m much happier with the project I finished today: the coveted Urban Aran from Patons Street Smart book. This pattern is great. I first saw it on brooklyntweed, but I’ve seen it on many other blogs, too. 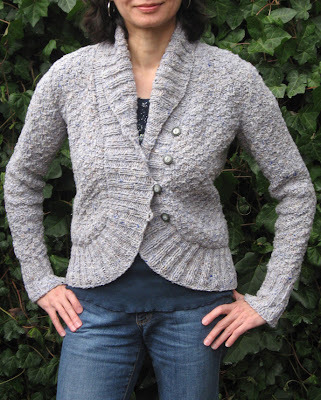 The ribs and cables in the chunky yarn add a lot of structure, maybe that’s why it looks great on both the lean and the curvy. I altered the sleeves and armholes a bit. They were a tad wide and short and seemed in danger of looking dumpy. I also knit the body back and forth on one long circular to avoid seaming. I used Elann’s Highland Chunky in Spiced Wine. I plan to wear it on the rooftop bar of the Hotel Oregon when I travel to Oregon's wine country later this week. The sweater looks great. A really great fall color.